Hello Kitty Fun Carnival is the newest Jollibee Kiddie Party theme in town! | Daddy O! 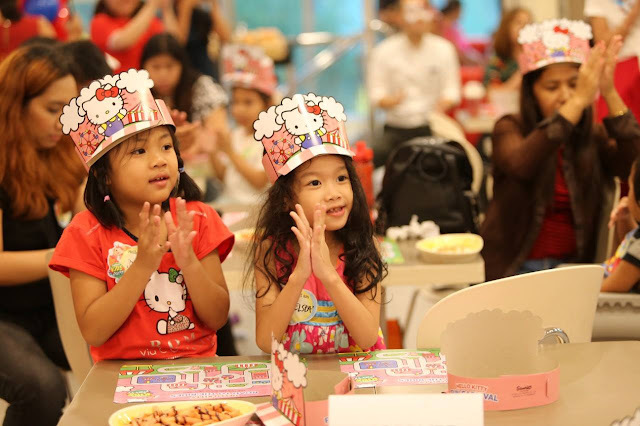 Home Kids Hello Kitty Fun Carnival is the newest Jollibee Kiddie Party theme in town! Hello Kitty Fun Carnival is the newest Jollibee Kiddie Party theme in town! 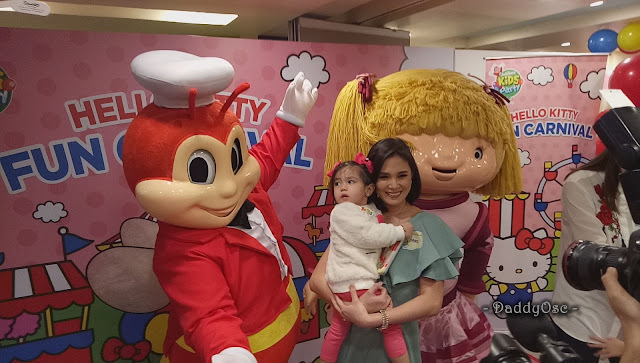 Jollibee Food Corporation headed by Ms. Charisse Sumulong (center), Senior Brand Manager Marketing Channel and Kids Marketing with celebrity guests Ms. Isabel Oli-Prats and daughter Feather and Ms. Bettina Carlos and daughter Gummy during the launch of the newest Jollibee Kiddie Party Theme - Hello Kitty Fun Carnival. Kids have now another options for choosing the theme when celebrating their birthday at Jollibee. 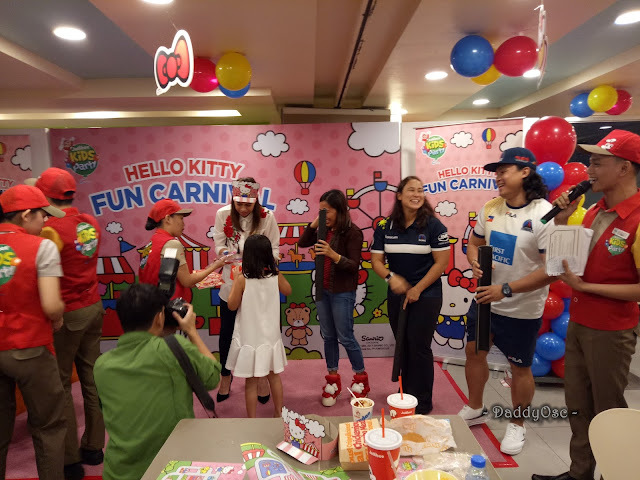 When the time of birthday celebration or any occassion, make your little (specially with your daughter) even more lovely and memorable celebration with the newest and cutest addition to the Jollibee Kids Party themes, the Hello Kitty Fun Carnival. 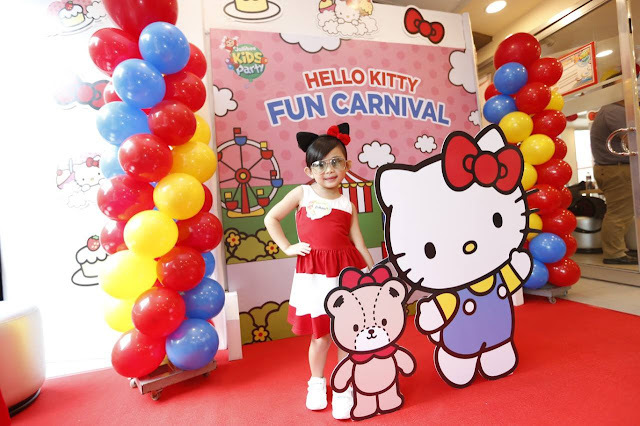 During the launch of Hello Kitty Fun Carnival, celebrity moms and their kids joins the celebration. 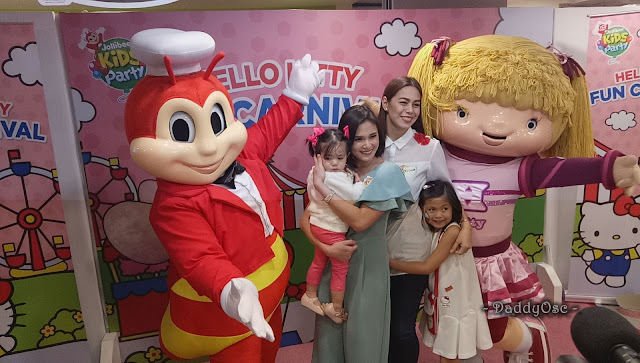 Ms. Isabel Oli-Prats and daughter Feather and Ms. Bettina Carlos and daughter Gummy with other kids celebrate enjoy the party. Ms. Isabel and Ms. Bettina participated in the games prepared by Jollibee's crew. It's like more of fun games. The team of Ms. Bettina won the game. Her daughter Gummy approaches her mom to claim the award. This adorable carnival theme, inspired by the sweet and beloved kawaii character, comes complete with langhap-sarap food, games and entertainment, awesome prizes and party favors, and a delectable birthday cake. 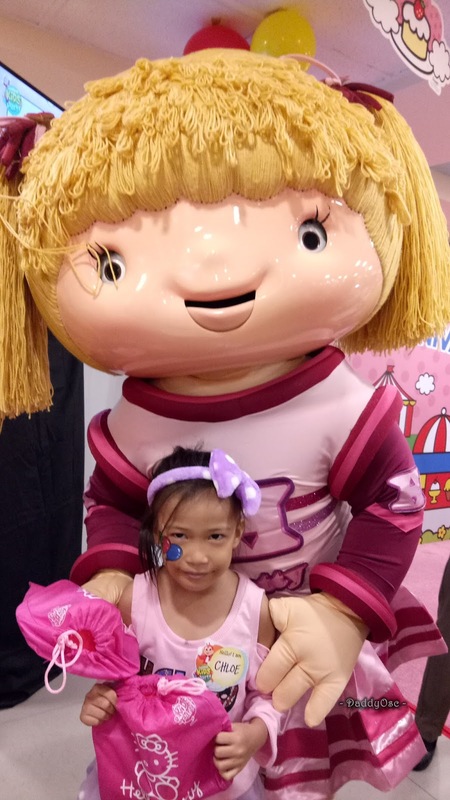 Let your kids experience wonder like no other as they imagine a magical carnival with thrilling rides and colorful surroundings through the party’s carnival-inspired decorations, games, activities and production numbers. 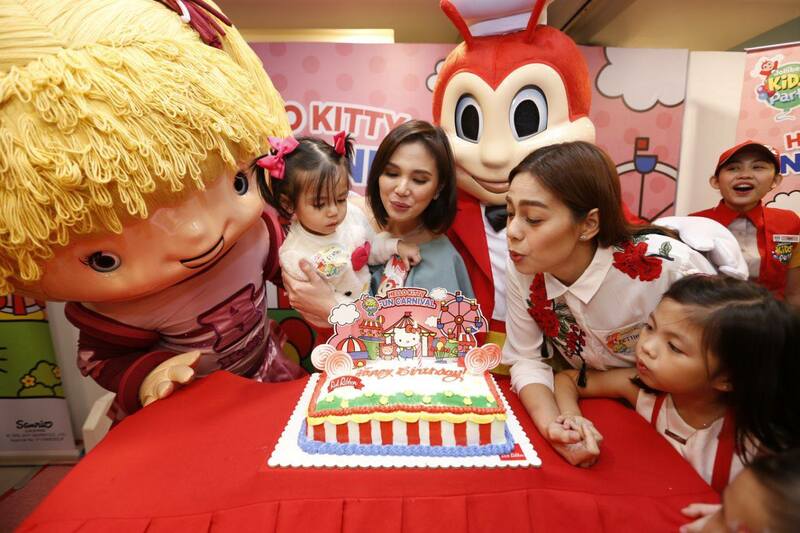 October, November, and December birthday celebrants with Hello Kitty Theme birthday cake! 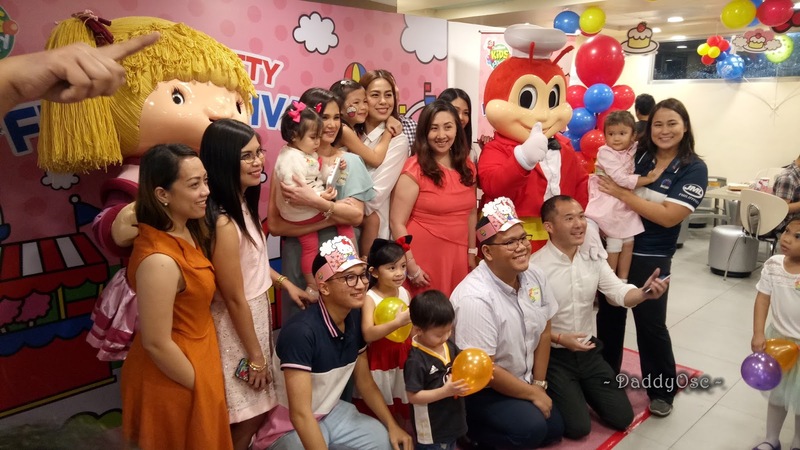 To launch this cute kid’s party theme, Jollibee organized a celebration full of exciting activities for media guests and their little ones at Jollibee E. Rodriguez in Quezon City. Kids and kids at heart also dressed up in their best Hello Kitty inspired costumes. 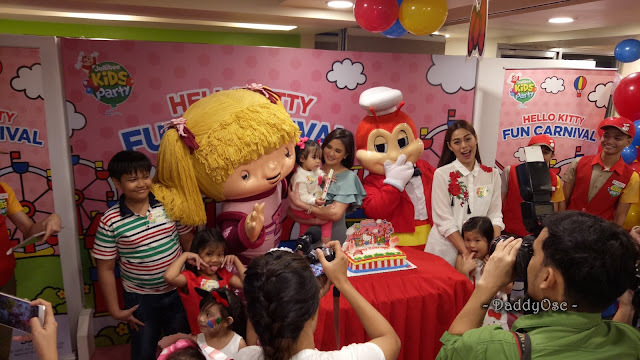 Feather Prats, Gummy Carlos, and their mommies blow out their cake with their favorite friends, Hetty and Jollibee. 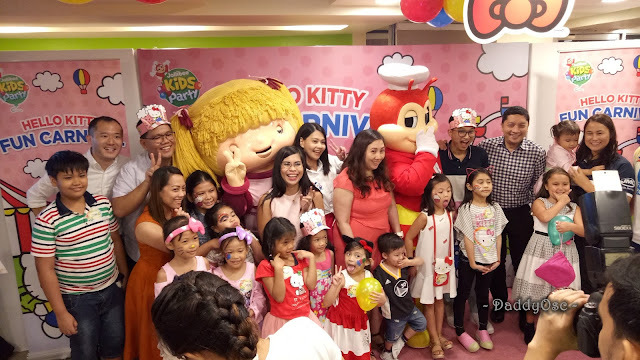 Mommies and little ones agree—there’s no better way to celebrate than with the Jollibee Kids Party Hello Kitty Fun Carnival. Photo shows Hetty and Jollibee with Isabel Oli-Prats, Ada Milby of Philippine Lady Volcanoes, Bettina Carlos, and their kids. 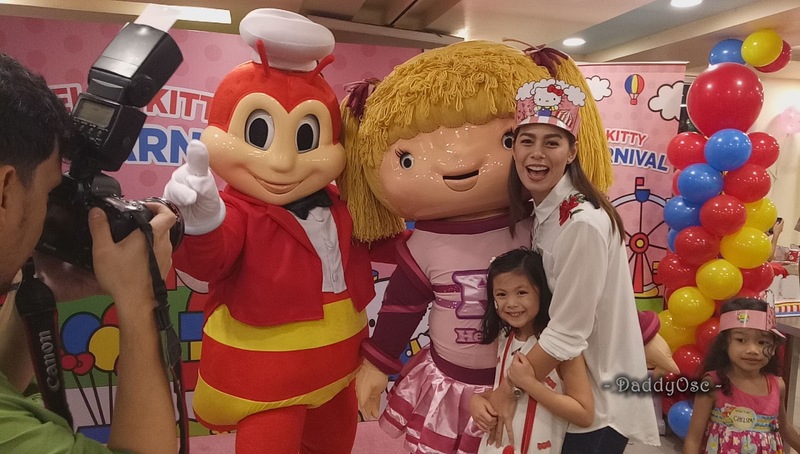 Bettina Carlos and her daughter Gummy join in on the fun at the Jollibee Kids Party’s Hello Kitty Fun Carnival launch. 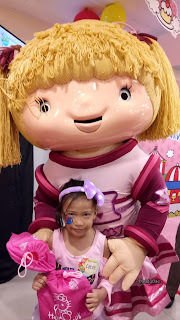 Little girls come in their favorite outfits in pink, red, and white to match the lovable Hello Kitty. 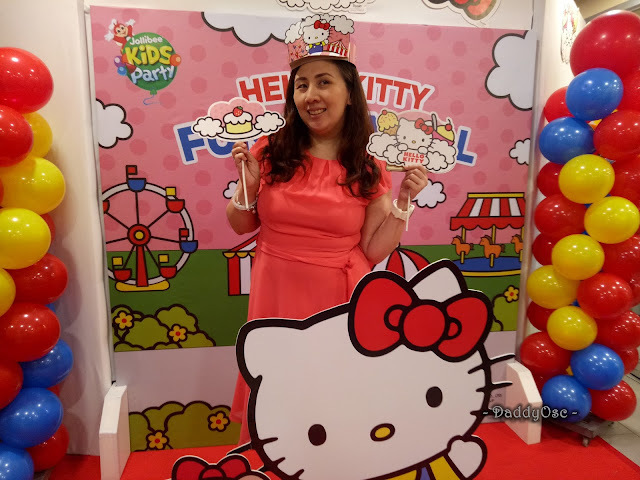 Feather and her mommy, Isabel Oli-Prats, come dressed to party with Hello Kitty. 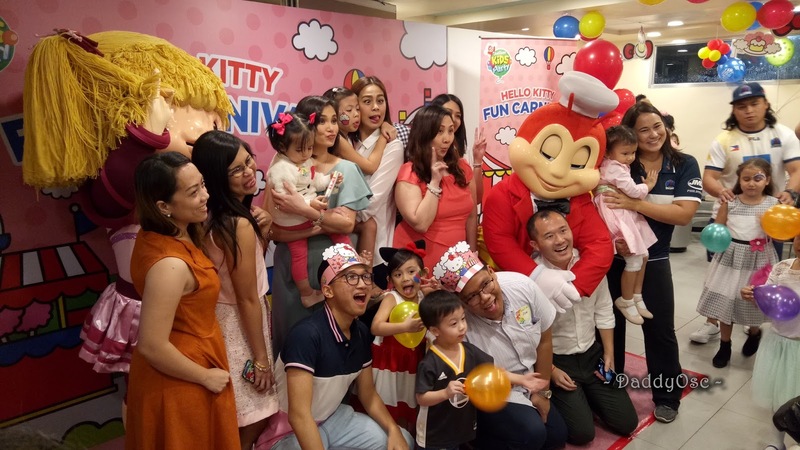 Jollibee’s much loved kids party transforms into the ultimate Hello Kitty funhouse as kids can expect a day of joy and excitement. 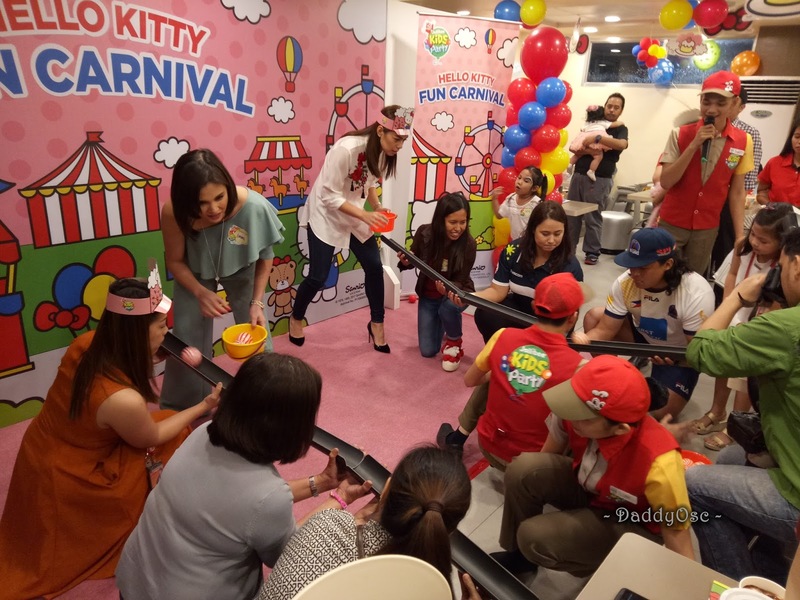 Here, they can enjoy Hello Kitty-inspired games such as Roller Coaster, Caterpillar, and Cotton Candy games, a special appearance from Jollibee and Friends, and their favorite Jollibee meals like Chickenjoy, Jollibee Spaghetti, and Yumburger. 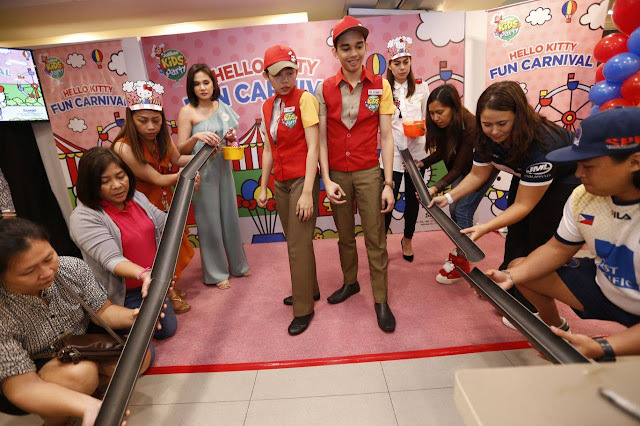 Guests were transported to a carnival fun land through the party’s amusing games and contests, cool prizes, and its cute face painting corner. 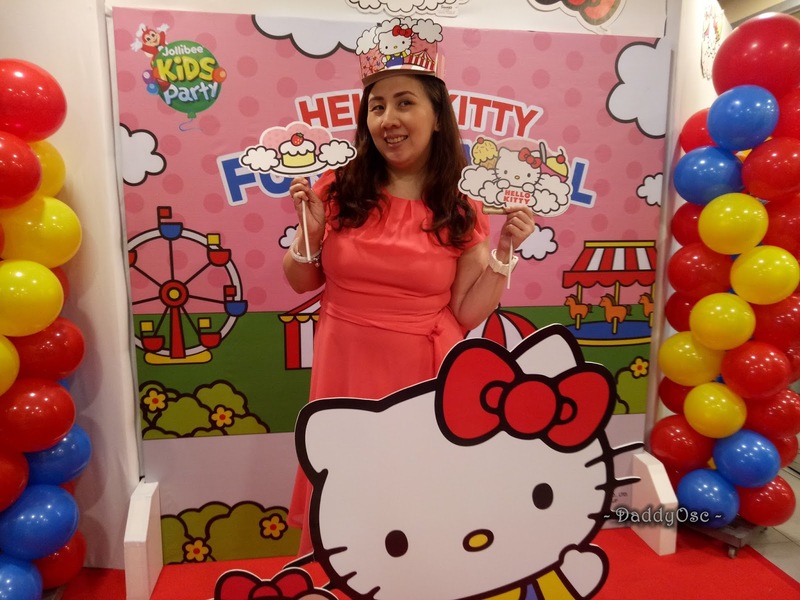 They also snapped picture perfect moments with the adorable Sanrio squad in the background at the party’s photo wall. Jollibee and Hetty also joined in on the bash with their special appearance and dance number while the kids enjoyed their delicious langhap-sarap meals. 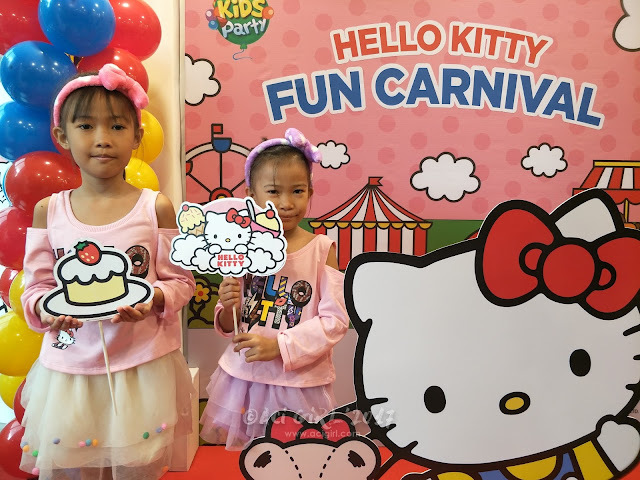 Let your children enjoy the jolliest birthday celebration with the new Hello Kitty Fun Carnival party theme. 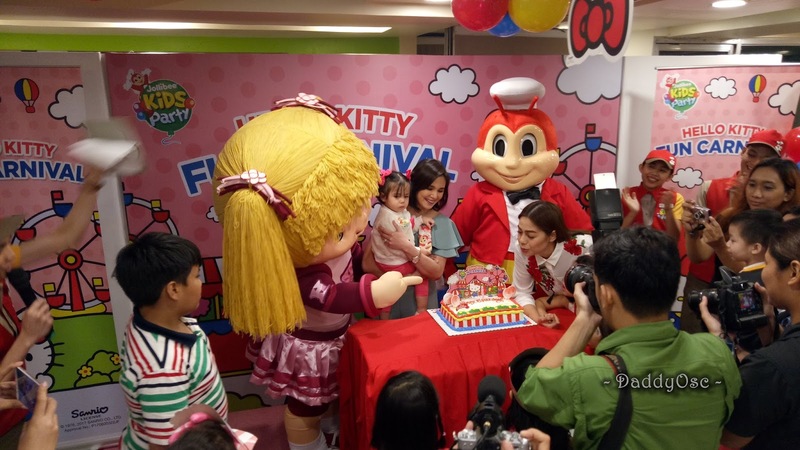 With Jollibee’s “Create-Your-Own-Package” option, parents can customize different party elements from 30 to 80 guests. 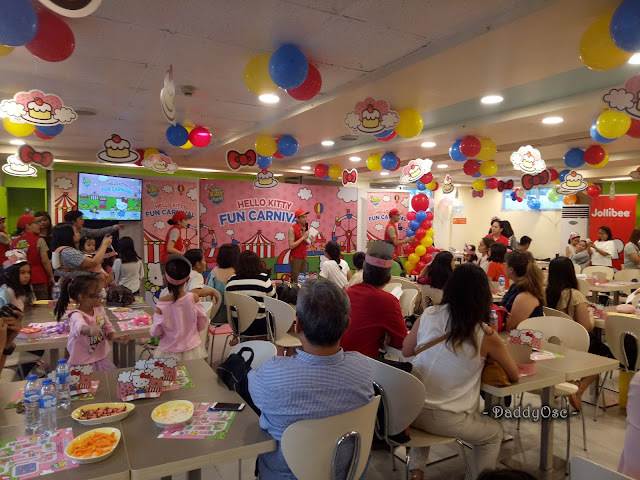 Choose from different Jollibee Kids Party themes: Jollitown, FUN-tastic Factory, JolliRace, and the latest addition, Hello Kitty Fun Carnival. With Jollibee’s various party themes, there’s a special celebration for every kind of Jolly Kid. 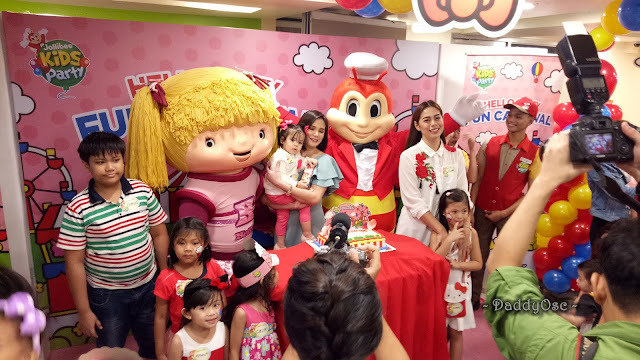 The Jollibee Kids Party is available for booking in store or set up in chosen locations. 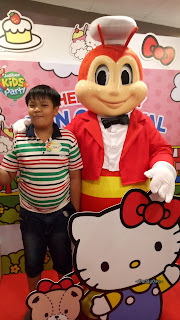 Check out jollibeeparty.com for more details.